A next-gen candidate attraction platform, designed to compliment and maximise your Bullhorn system. Multi-post your jobs to boards, LinkedIn, Facebook, Twitter and Indeed to create a constant pipeline of fresh talent. We deliver all your applications back into Bullhorn. idibu is true SaaS and we work with over 500 clients throughout the UK, APAC and the US, including the likes of Kelly Services, NES Global Talent, O2, Fujitsu, Pertemps, Roth Staffing and many, many more. Create a constant pipeline of fresh talent, delivered directly into Bullhorn with our job multi-posting service. idibu posts your jobs across the net in minutes attracting candidates from job boards, LinkedIn, Facebook and Twitter. We hit over 750 global job boards as well as all major aggregators such as Indeed, JobRapido etc. 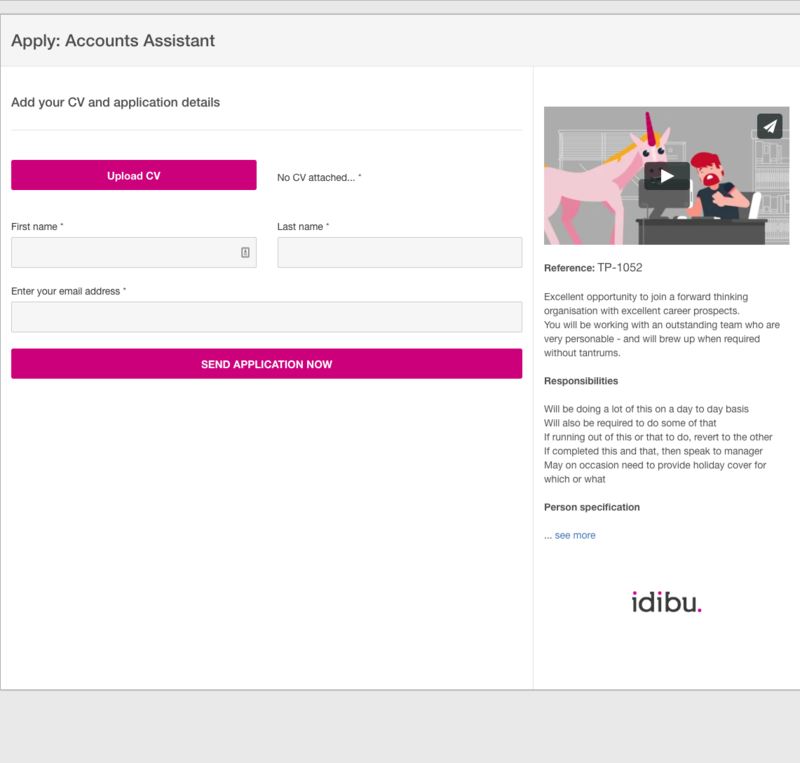 Easily track, assess and manage all applicants easily with idibu. Our rich candidate profiles give you a detailed overview of skills and suitability so you make better decisions faster. Review the candidates original CV inside Bullhorn with no need to download! Our social media footprints give you with a direct link to candidates’ pages and provide a well rounded view of their interests and motivations. Once reviewed, our easy to use traffic light filter means you can progress people back into your Bullhorn account in minutes. Our advanced auto-responders mean we take the strain of communicating with candidates during the first stages of the application and keeping them fully in the loop. Find out which attraction channels are working for you and which aren’t with our advanced reporting suite. Over 16 reports detail all your activity and provide detailed feedback on which boards are working for you and which aren’t. idibu utilises the latest webhook technology including a full Zapier integration which means you can send your data out into any systems you use – from Google Sheets to machine learning analytics, and any other applications that form a part of your business. Why not automatically set applicants you accept for a role to be automatically sent a psychometric test? There are a myriad of ways idibu can automate connecting you closer to your candidates and your workflows. Tell the story. Get the data. Get it into Bullhorn. Landing pages help you get key info at the application point and push it directly into Bullhorn. They also connect better with candidates by improving the application experience with time saving tools such as “Apply by Seek”, Monster etc. as well as easy CV upload from mobiles by access to services such as Dropbox and Google Drive. Our video and text fields mean you can tell your story better to talk a little about the why not just the what. This helps you to build your brand = more candidates. Plus, well designed pages means no ugly, overlong forms which can put people off making that application. Our selection of questions, text fields AND video interviews get you the data you need to better review and shortlist candidates. And remember, everything we get, we push into Bullhorn. Added bonus is for often overfilled roles, you have filters and rules to auto-screen applications to massively save time on non-suitable applications.